Olivet College’s third Cultivating Women Leaders (CWL) event will take place March 22 at Cutler Event Center, Olivet College. Under the theme Together We Rise, the event will inspire and equip young women to embrace their inner strength and realize their potential as responsible leaders. Here are five top things to know about the event. Polo Reo Tate, author of “Deep Dark Blue: A Memoir of Survival,” is the keynote speaker. Tate, a Lansing native and the great-great-granddaughter of automotive pioneer Ransom E. Olds, was eager to accept the challenges that awaited her as she headed to the U.S. Air Force Academy after high school. However, Tate was not prepared for the harassment as well as the physical, emotional and sexual abuse from her peers and superiors that greeted her arrival — a horrific personal journey of survival and resilience Tate unflinchingly chronicles in her memoir. Tate’s compelling and eye-opening odyssey of grace and reclamation as well as her courageous and positive outlook on life serves as motivation for women of all ages. The first-ever “Let’s Get Real” panel will share an authentic look at the challenges and triumphs of successful female leaders. The “Let’s Get Real Panel” will feature Delstene Atkinson, special assistant to the president, Olivet College; Jacqueline Bougie, owner/creator, Searchlight Healthcare Advocates; Traci Corey, director, Olivet College Women’s Leadership Institute; and Melanie Estes, vice president, transportation practice lead, DHS Consulting. The panel members will share personal experiences by answering questions like what moments made it all worth the fight; at what age would you go back and give yourself advice and what would it be; what made you find your voice and when did you find it; and what was your greatest challenge and how did you overcome it. Speed networking will take a new approach, allowing attendees to customize the field in which they network. 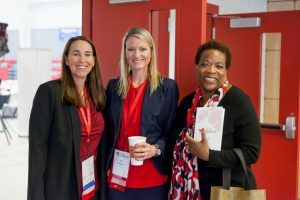 Speed networking is a staple session at CWL, but this year’s session has been customized to allow participants to connect with female leaders and fellow students in their chosen field of interest. Attendees had the ability to mark their field of interest on the registration form and the room will be divided to reflect these selections during speed networking. Past attendees have expressed the session afforded them the opportunity to meet face-to-face with role models and icons who otherwise would only be available through the media. Past CWL favorites are included in the lineup. Back by popular demand, the third “Olivet College Alumnae Panel” will feature Melanie Engels ’08, Dominique Giroux ’18, Rose McKinney-James ’73 and ReGene Thompson ’17, facilitated by Sheri Jones, WLNS news anchor. In addition, the event will also include “Dress for Success,” “Negotiation Skills,” a performance by the OC Gospel Choir and a ceremony honoring the second ATHENA International Women’s Leadership Program cohort. Plus, a new panel will debut, “Be the Change,” featuring Olivet College students Nicole Deweyert, Brittany McDuffie, Matthew Ellis and Tyler Nobel. The impact doesn’t end with Cultivating Women Leaders. 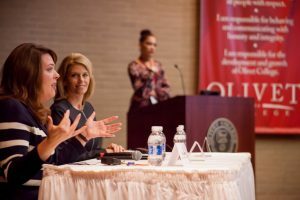 The Olivet College Women’s Leadership Institute includes many other opportunities for any student who identifies as a female to learn and grow. This June, two Olivet College ATHENA International Leadership Camps will be held. The first camp will be presented for high school students June 21-23, followed by a specialized middle school camp June 23-25. Further, OC welcomes high performing students to apply for the Keyes-Barber-Benedict Scholars Program, a focal point of deep engagement for a select group of women student leaders at the College. Learn more about CWL, view the event agenda and read the speaker bios. For questions, email cwl@olivetcollege.edu. Learn more about Olivet College by contacting the Office of Admissions at 800.456.7189 or admissions@olivetcollege.edu.